Sydney FC's injury woes have continued with defender Ben Warland rupturing his anterior cruciate ligament and being ruled out for up to 12 months. 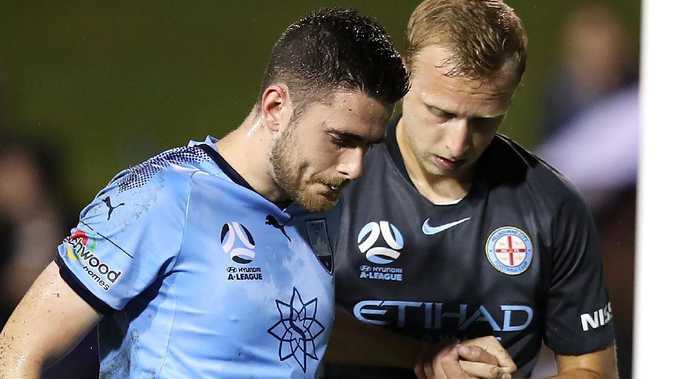 After suffering a broken foot in pre-season, the 22-year-old defender took a blow on the knee in Sunday's defeat to Melbourne City, with subsequent scans revealing the extent of his injury. The injury comes at a crucial time of the season for Sydney, with five rounds of the regular season left and two games gone in the Asian Champions League. It means Sydney boss Steve Corica will have to reply on out-of-favour Dutchman Jop van der Linden or departing centreback Aaron Calver, who has signed for Western United for next season. "It's disappointing for Ben," said Corica. "He's been doing extremely well at centre-half but he is a quality professional, he has great strength and character and I know he will come back even stronger. "We have a fantastic medical department at Sydney FC, who will guide Ben through the process as they have with others before." Warland's injury adds to a freak list of injuries, with Chris Zuvela and Trent Buhagiar both out for the season due to serious knee injuries and Siem de Jong and Danny De Silva missing in recent weeks, though Corica hopes to have the latter two back to face Brisbane a week on Friday.